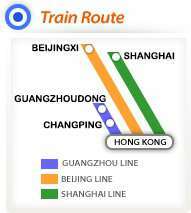 You can buy Beijing/Shanghai - Kowloon Through Train ticket at discounted rates. For details, please refer to table below or call our hotline (852) 2947 7888. Note 1: Return tickets for Beijingxi to Hung Hom (Deluxe Soft Sleeper only) are available at the ticket sales outlets in the Mainland only. Note 2 : No discount during the Chinese New Year period and summer peak period. Note 1: Return tickets for Shanghai to Hung Hom (Deluxe Soft Sleeper only) are available at the ticket sales outlets in the Mainland only. Child tickets are for children aged 5 to 9 only. Passengers aged 10 or above should purchase adult tickets. A child under the age of 5 and accompanied by an adult with a valid ticket may travel for free, provided that the child does not occupy a sleeper.Tickets are valid only for the boarding station, train number and date as shown on the ticket. Please refer to the station notice for the latest information.